Once again thank you for your support in voting us number one for the past six years. We have worked hard to earn the trust of our customers and we do not take that lightly. With the demand for outdoor living at an all time high, it's time to to stop dreaming and time to live the dream of your very own outdoor living area that you and our experienced team of professionals can help design. 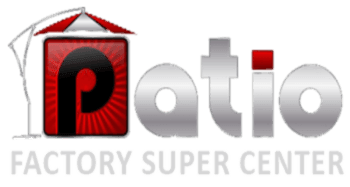 The Patio Factory Supercenter offers the best selection of the industries finest outdoor furniture on the market today at factory direct prices that won't be beat. With locations in Sarasota, Bradenton, and Clearwater, we cover the west central Florida market with quality, design, experience, and pricing that other patio furniture stores can only strive for. We carry Aluminum, Cast, Wicker, and Wood outdoor furniture with the industries best warranties and offer only the finest in outdoor fabrics including Sunbrella, Fhifer, and Outdura to choice from. The possibilities are endless and only limited by your own imagination as you establish the ambience that our furniture will provide for your outdoor oasis. Our collections of designer and casual patio furniture offer many choices of Dining sets, Bar sets, Balcony sets, Sofas, Loveseats, Lounge chairs, Action Rockers, chaise lounges, and deep seating sectionals all in 150 different fabric choices and in Sling, Comfort Sling, and deep seating cushion. We also offer 15 powder coated frame colors with a UV Protectant to complete your vision. We have the patio furniture you need to make your outdoor environment as exquisite as your dreams will allow you. Come visit us at one of our three family owned and operated locations so we may show you the possibilities.